Hello! We are back from our gorgeous trip The Living Studio Along the Danube. I will have a post very soon with some of the photos and my thoughts of our time together (Hint…it was incredible). I wanted to let you know about two beautiful things happening this next week in the studio and also online. We are honored to host Wendy Brightbill for a two day workshop in our studio on our land. 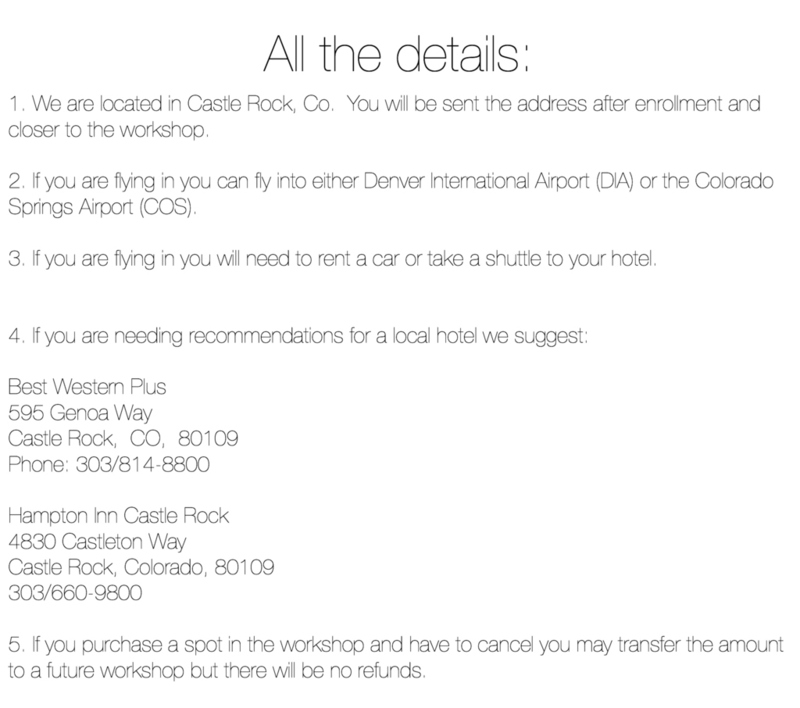 There are only a few spots left and we would be so honored to have you join us. 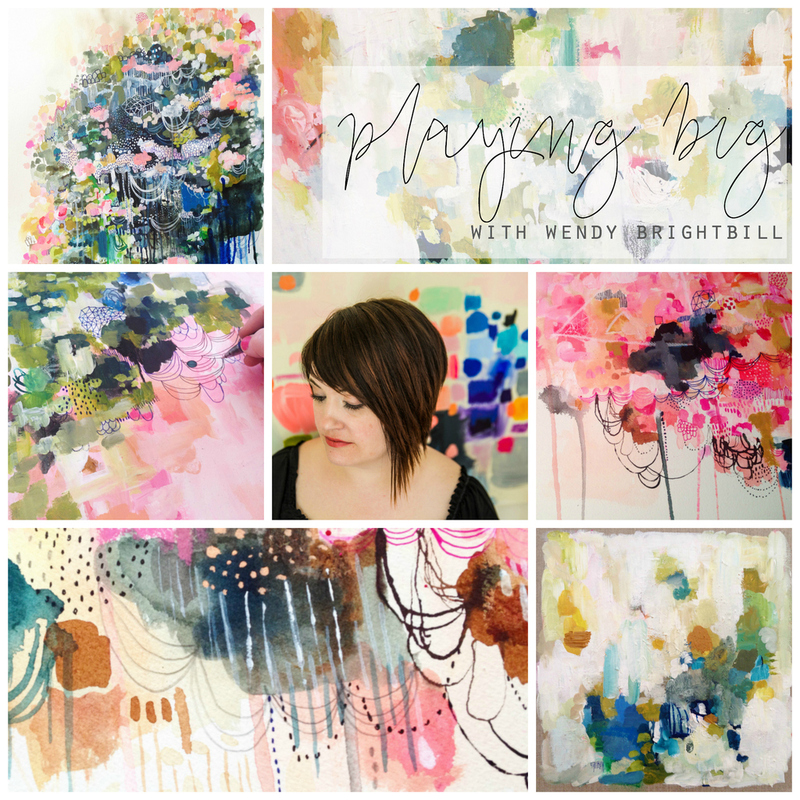 My dear friend and respected artist Wendy Brightbill will be coming to teach at our new studio! This will be the last live workshop of the year at our studios and it will be a workshop that you will not want to miss. This workshop is a two day event!. Come and read all about. This workshop will sell out so please do not wait too long if you want to register. 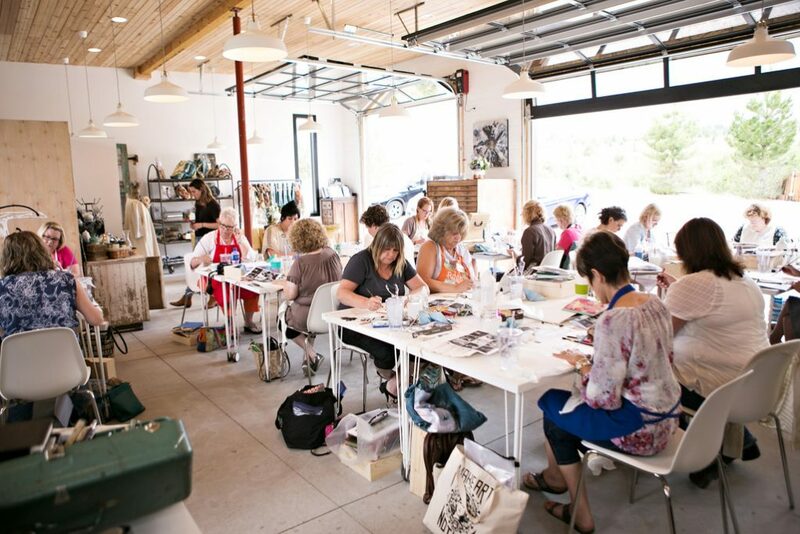 Our workshops are about getting away, enjoying the view, being pampered, connecting with other creatives and going home with fresh inspiration that you can apply in your own work. 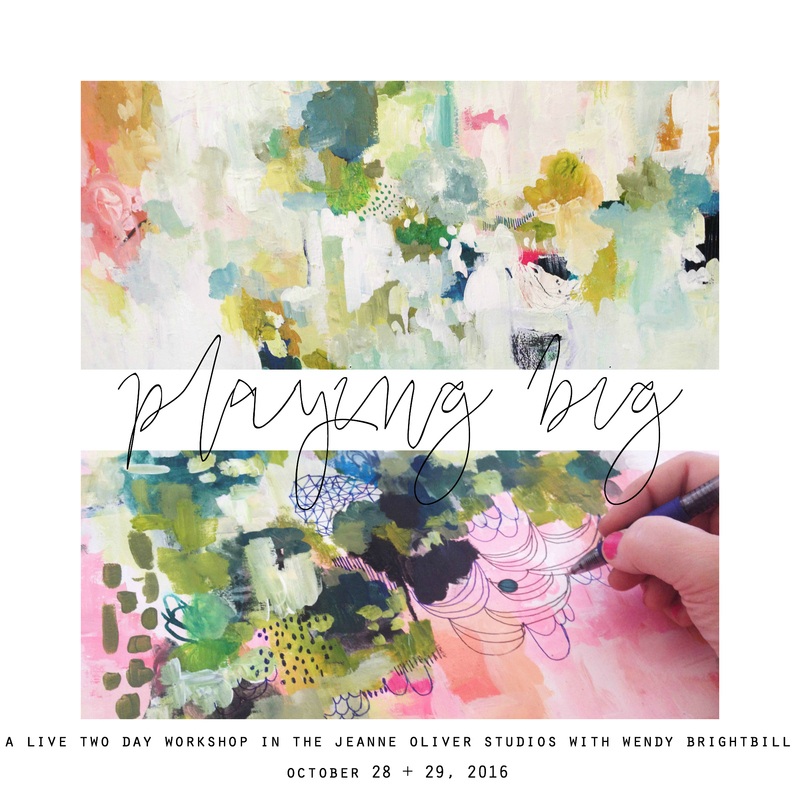 Is there something keeping you from playing big in your painting? Are you wanting to push through creative blocks and create the kind of art you see in your dreams? 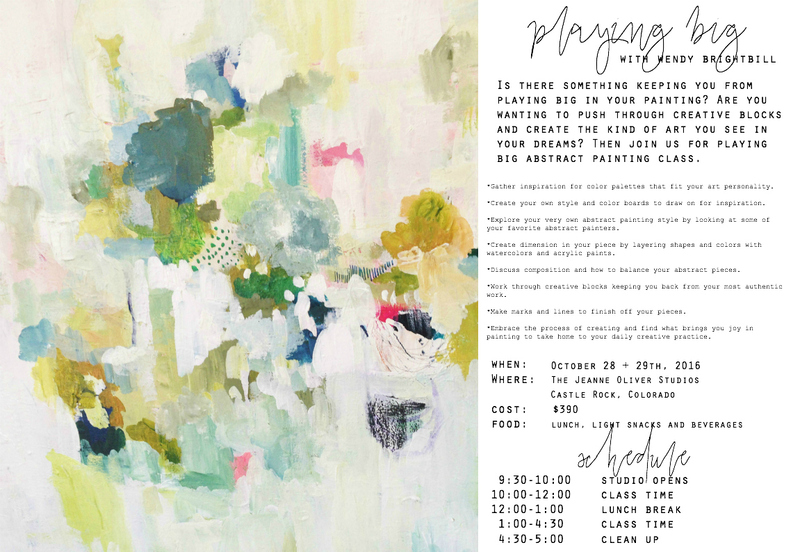 Then join us for Playing Big Abstract Painting Class. This last year I noticed that there was a real disconnect in the art that I was making and the art I really wanted to make. For whatever reason, I just wasn’t painting what I really wanted to paint. So I gave myself permission to really play big! This class is all about taking big risks and putting it all out there. No holding back!!! Working on a large piece of watercolor paper, we will explore color, mark making, style and composition. Get lost in the process and create with abandon. Gather inspiration for color palettes that fit your art personality. Create your own style and color boards to draw on for inspiration. Explore your very own abstract painting style by looking at some of your favorite abstract painters. Create dimension in your piece by layering shapes and colors with watercolors and acrylic paints. Discuss composition and how to balance your abstract pieces. Work through creative blocks keeping you back from your most authentic work. Make marks and lines to finish off your pieces. Embrace the process of creating and find what brings you joy in painting to take home to your daily creative practice. 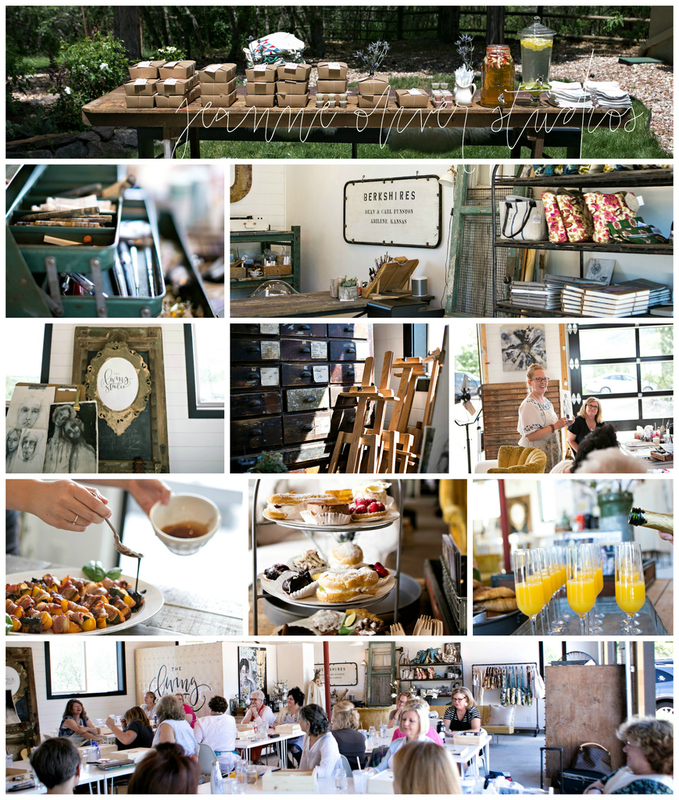 A peek into our beautiful studio! If you have any questions please email us at contact@jeanneoliverdesigns.com or if you want to register please click on the image below! 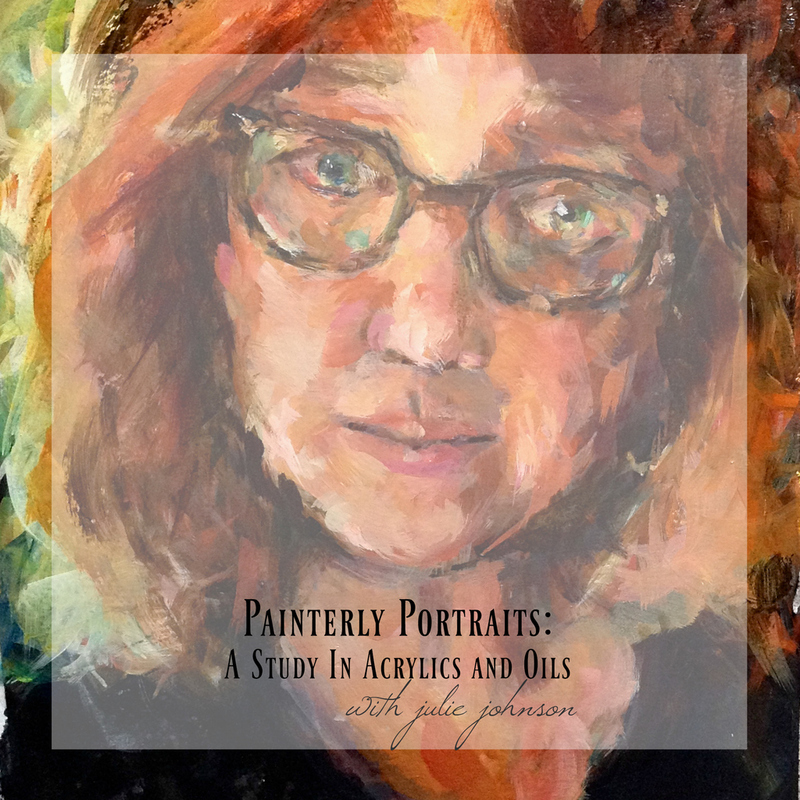 This coming Monday you can join loved artist Julie Johnson online for her newest course Painterly Portraits! I am smiling from ear to ear to share that one of our most popular teachers is back with a brand new online course! 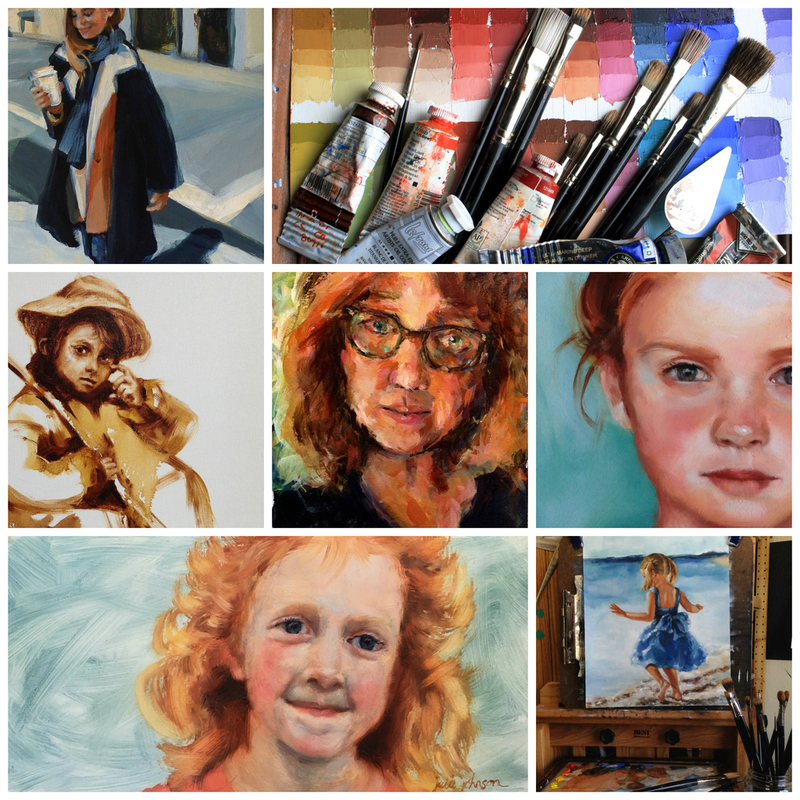 Join us for Painterly Portraits: A Study in Acrylics and Oils with Julie Johnson! I encourage you to come along with me if you want to learn to paint. You will learn to paint from your heart, Do you feel like you are missing something? It’s not about talent. It is about applying your love of something that you know is in you. I will help you discover that inner passion of art that has begun to come out in you or you have just realized this is something you would love to discover. Know each of us will have a beautiful and different outcome. You will be loved as I walk along side you. I will break down every step, show you my palette as I paint and see me mixing colors then laying that color down.I am a artist who loves realism. It’s where I first started as an artist in art college studying illustration. It is important to gain the fundamentals that will make your art strong and loved by others. With those fundamentals we can play! Playtime with painting is getting loose with our edges, finding texture, light and darks. A beautiful thing will happen, you will find emotion without even trying. Here are some of the exciting things we will find as we come to the easel. * The energy from a stroke of paint from our brushstroke. * Color, tone and mixing colors. * How to lay down our paint. * Why I need strong shapes to help my composition. * How do I sketch with paint? * Can I create a acute likeness? * What is a indirect and direct method of painting. * How to work from a photograph. * We will breakdown the face into shapes and planes. This 7+ hours of content class will be begin on October 24, 2016 and you will have lifetime* access to the class. 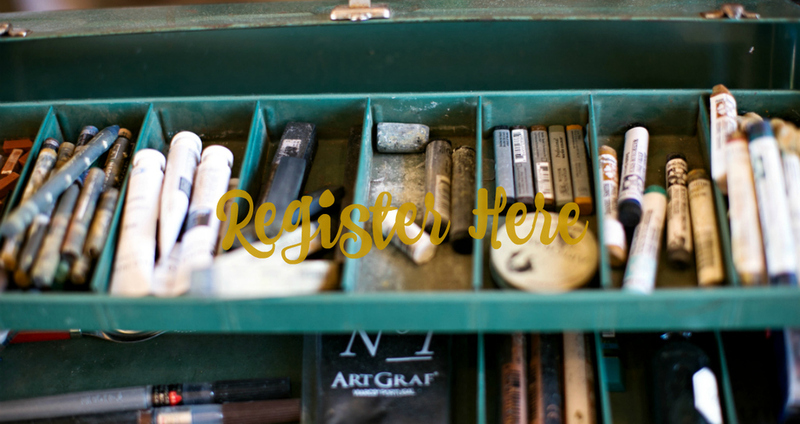 The registration price for Painterly Portraits: A Study in Acrylics and Oils is $48.00. Here is my list. We will be using mostly paint. Please read though and know you can substitute and use what you have on hand. I don’t want you to have to purchase a lot of supplies. We will be mixing our own blacks. You have the opportunity to use all acrylic for each lesson or all oils. All lessons are interchangeable with what medium you choose. I will be doing my best to use the same color palettes for both the acrylic and oil paints. It is important to get accustomed to mixing a color palette we will use. During playtime we may venture into new mixtures. Here is my list of colors. You may substitute brands. Please stay away from: the craft paints as they chalky, full of fillers and don’t have much pigment in them, also avoid anything with the word HUE behind them they are a imitation paint and will not mix good color results..leaving you with mud. I will go back and forth using both heavy body and fluid colors, but you can use either heavy or fluid or both. I am a lover of the flat brush. 1.5”, 1” size or 1/2”. I always find them in my hand. I can change the edges and get the wide edge then the thinner edge. But you can use what you like. I will be encouraging you to always use a larger brush. The results; a more painterly painting. I realize paints can be expensive but I believe it is best to practice with the best materials we can so we don’t get frustrated and give up. It doesn’t have to be hard. Think in terms of a piano that is in tune or out of tune. Here are the colors and brands I use. You do not need to use my brands. There are a lot of yellows and reds out there and the all mix a little differently but it totally ok to use different brands. There are a couple of colors that I find you need in mixing colors. I will asterisk them **. Please stay away from false colors that have the word “Hue” behind them. They are full of fillers and not much pigment. You will not mix a true color and end up with muddy colors. Also know that The student grade “WINTON” on Windsor and Newton brand is mostly filler and little pure pigment…..yes the muddy colors again. Please use the 40%coupon at Hobby Lobby. They carry the Windsor Newton brand. Gamsol a 100% pure odorless mineral spirits. The least toxic. The only thing I use to clean my brushes. Viva towels the most absorbent and the paint doesn’t get all over my hands. I prefer a glass palette. But you can use whatever you like. I got mine from a consignment store I use in a picture frame. If you get this set you will have everything you will need. Brushes are like the reed to a clarinet. They take a lot of the work of painting. I will put together my favorite list for you. Here you have a diverse group of choices. You can choose so many different surfaces from a smooth portrait grade linen by Ray Mar, to a gessoed primed birch cradle panel. I have been staying away from the canvas panels you will find at your hobby Lobby or Michaels store. Why, because they pull at my paint making painting hard. I could still use them if I coated them with gesso and sanded them 3x’s. I have fallen in love with the cradle boards and linen. I don’t use linen often, but when I do it always gives me goose bumps because its simply divine. Pick out any size you would like to work on. I will go into more on substrates in the class.